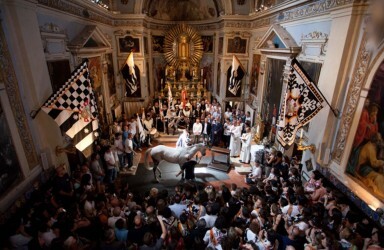 Next Sunday, August 16th, the Palio horse race will be run in Siena. The benediction of the horse and the jockey in their respective contrada churches will take place at 3pm. This is a very particular moment, both delicate and very emotional for the contrada members. It is a mystical rite with the horse and the jockey in front of the altar. The priest concludes the rite with a wish that is almost an order: "Go and come back victorious!" Tourists can try to ask admission inside the church: keep in mind that it can be denied and, in case of admission, absolute silence is requested and the use of flash is forbidden.